Kokusai Express Japan small package delivery by air and sea leaves you with the choice. You get to pick what way of transportation fits your needs the best. We offer to you all sorts of services- from air parcel delivery service to much faster maritime parcel delivery service! Kokusai Express provides the air parcel delivery service, by which customers can send gifts or samples purchased in Korea or Japan, e-commerce goods (shopping malls, purchasing agent service) and etc. by air on a fast and convenient basis. ※ On the day the parcel arrives in Korea, it is to be customs cleared and delivered. Please feel free to contact us. This is our creative service which complements the weak points of higher air fares and late transport period of a general container ship. Since it uses the high-speed ferry ship between Osaka and Busan, this service can be provided on a faster basis even at a lower price; thus, this service is suitable for homecoming moving cargos of students studying abroad, volume and heavy cargos such as car bumper, and e-commerce goods (shopping malls, purchasing agent service, etc.). This service is a very convenient service for students studying in Japan or resident employees to send their moving cargo to the destination when they come or are dispatched to Korea as a resident employee. Kokusai Express promises to provide trust and reliability. Relief– We recommend you use our international package delivery by air and sea because we are trusted and reliable company. Taking care of your package safety. Plus, we offer to check on where your package is any moment. Convenience– Yours is just to make a phone call. We offer to do everything else! Answering different needs you might have. Including high-quality delivery service, low-budget maritime transport, fast air package delivery etc. Sincerity– With the level of commitment of our employees, your beloved will even feel the kind love you sent them together with the package. Kokusai Express Japan is fast and cost-effective– We use high-speed ferry ships. This way, you get to have your package delivered fast and at a low cost at the same time! If you have a case of an emergency, you can send your package by air, and we shall work on achieving the affordable price even for this kind of transportation! Regardless of the weight or the size of your parcel, Kokusai Express Japan rapidly delivers all kinds of documents across the borders. We collect the package, pack it, transport and deliver it to the address you choose. Hence, we are the real door-to-door service. Sending your parcel directly from your hands to the hands of a person you are sending the package to. Your package is safe with us. Regardless of the size. We conduct even the customs clearance services for you. So it is up to you just to hire us. We do the rest. This is the same-day-quick delivery service. So whatever cargo you have that is urgent to get transported, and permitted to be imported/exported, give us a call. We will arrange it! Imported goods that might affect the domestic economy and/or public security are subject to import regulation. Import of these goods must be permitted and approved in advance according to other laws and proved their permission/approval to the Customs when they are reported for import. Other laws refer to domestic laws that define permission and approval of import/export, other than customs law, tariff law, or provisional tariff law. They are mainly specified in Articles 67 and 70 of the customs law. For more information, please visit the Japan Customs website by clicking on the picture. Kokusai Express Japan complies with the legal criteria and conditions prescribed by the customs offices and relevant institutions in Korea and Japan in terms of international cargo carried in from foreign countries and makes best efforts to thoroughly block the carry-in of illegal articles such as smuggled goods, drugs and terror-related articles. any and all articles to be imported by e-commerce companies that are designated as a special customs clearance company. The products imported by an e-commerce company which is not designated as a special customs clearance company should go through the general import declaration and customs clearance process.Any e-commerce company that is not designated as a special customs clearance company and directly imports goods (Type A of e-commerce) not via a certain express company without the general import declaration process shall be subject to a penalty. If a national (permanent residents abroad excluded) who has lived for more than 1 year abroad moves from the residing foreign country (A) to another foreign country (B) and he/she sends the used goods again to Korea, such goods are recognized as moving cargo (during customs clearance process, the relocation-related documents shall be submitted to customs office). Precaution: You are required to carry your passport and ID card with you (for comparison of dates of departure/arrival); both the dates of departure/arrival should be confirmed. The certificate is available to be issued after the arrival in Korea. Moving cargo and travelers’ deliverables are to be duty-free and customs cleared only after the person who sends those abroad arrives in Korea and submits clearance documents; provided that, any new product included in moving cargo shall be subject to taxation. securities, precious metals, jewelry, artworks, and antiques etc. Information of sender: The name, contact number, and the address of the sender. If the sender is a company, fill out the company name and department, together with the contact person. Information of receiver: Also the name, number and the address, together with the contact person if the receiver is a company. If you make a mistake, the delivery might be delayed. Payment of charge: Choose the method that suits you the best. Destination duties/ taxes: Select who pays the taxes at the destination. Service type: Divide document, duty-free cargo, and taxed cargo. Picked up by/ date: Fill out the name of the person to pick up the package, as well as the date. Shipment information: The number of boxes, the weight and the volume of cargo you are sending. A full description of the content: Brand name, product name and the price of the product. Sender’s signature: Fill out the date and sign the document. Fill out the blanks in red with ★. For the sample form and precautions, move the cursor to view them. For currency unit, select one from the combo box. Enter the quantity and cost of deliverables and the sum amount is automatically calculated. Specify the exact product name and quantity for smooth customs clearance. 1. 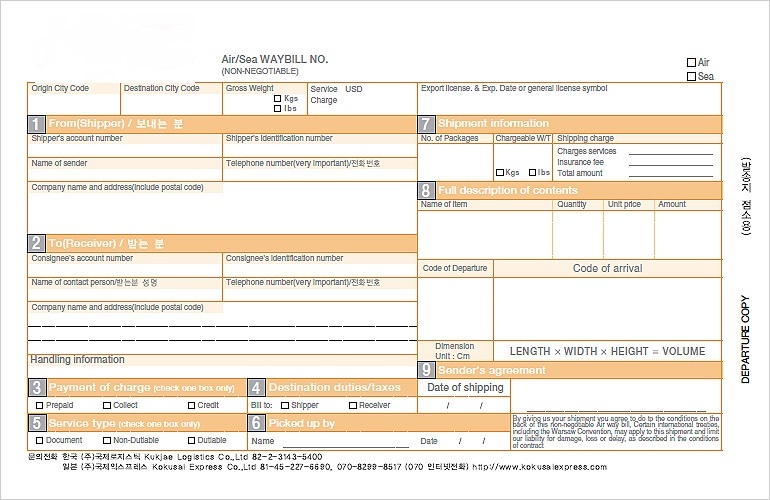 By tendering items to KOKUSAI Express for shipment, the Shipper identified on the face of this AIR WAYBILL; agrees to all the terms and conditions herein stated. This Waybill is non-negotiable and the Shipper acknowledges that it has been prepared by the Shipper or by KOKUSAI Express on behalf of the Shipper. The Shipper warrants that it is the owner of the goods transported hereunder or It is the authorized agent of the owner of the goods. No agent or employee of KOKUSAI Express or the Shipper may alter or modify any of the terms and conditions herein Stated. a. The Shipper warrants that each article is properly described in this Air Waybill and that the shipment is properly marked, addressed and packed to ensure safe transportation with ordinary care in handling. b. 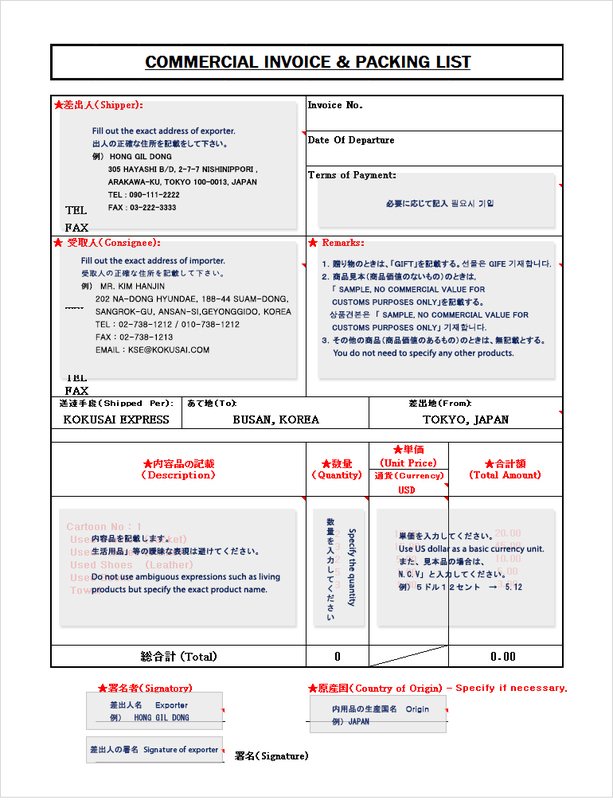 The Shipper certifies that all information provided to KOKUSAI Express orally; or set forth in this Air Waybill and any related documents, is accurate and complete. c. The Shipper shall be solely liable for all costs and expenses related to the shipment and for costs incurred in either returning the shipment to the shipper or warehousing the shipment pending disposition. d. The shipper agrees to indemnify and hold KOKUSAI Express harmless for any claim, liability or expense arising from the shipper’s failure to comply with any applicable law or regulations. a. KOKUSAI Express reserves the right, but not the obligation, to inspect and to open any shipment, With regard to each shipment KOKUSAI Express reserves the right to correct any under declaration of weight and to re-invoice the shipper accordingly. b. The Shipper acknowledges that KOKUSAI Express reserves the right to refuse or abandon the carriage or transportation of any shipment at its discretion of such shipment would be likely to cause damage or delay to other shipments, equipment or personnel; is economically or physically impracticable to transport; is improperly packed ; or it the transportation of such shipment is prohibited by law or regulation of any federal, state or local government in the origin or destination countries or is in violation of any rules, contained in this Air Waybill or any provisions of KOKUSAI Express’ General Conditions of Carriage for International Cargo c. KOKUSAI Express shall have a lien on any goods shipped for all freight and storage charges, customs duties or penalties, advances or other charges of any kind arising out of transportation hereunder and may refuse to surrender possession of the goods until such charges are paid. The Shipper warrants that all applicable customs, import, export and other laws and regulations, of all countries to, From, through or over which the shipment may pass have been complied with, KOKUSAI Express is authorized (but Under no obligation) to complete on the shipper’s behalf any documents required to comply with such laws and regulations, and to act as the shipper’s forwarding agent for customs and export control purposes. b. No service shall be rendered in the transportation of any of the prohibited articles listed in the General Conditions of Carriage for International Cargo. c. No services shall be rendered in the transportation of any article weighing more than 60 pounds or exceeding 100 centimeters in length, or exceeding a total of 160 centimeters in length and girth combined. a. KOKUSAI Express shall not be liable for any loss, damage, misdelivery or non-delivery due to Acts of God, force majeure occurrences or any cause reasonably beyond the control of KOKUSAI Express including, but not limited to, perils of the air, weather conditions, mechanical delays, acts of public enemies, war, strikes, labor disputes, civil commotions, or caused by the nature of the shipment or other defect, characteristic, or inherent vice thereof (including electrical or magnetic injury, erasure, other such damage to electronic or photographic images or recordings in any form), or caused by the acts or omissions, (including, but not limited to, improper or insufficient packaging securing, marking or addressing or the violation of any term or condition hereof) of the Stripper, the Consignee or any other party with an interest in the shipment. b. KOKUSAI Express shall not be liable, in any event for any consequential, special or incidental damages or other indirect loss however arising, whether or not KOKUSAI Express had knowledge that such damages might be incurred, including, but not limited to, loss of income, profits, interest, utility or item kept. c. THE RULES RELATION TO LIABILITY ESTABLISHED BY THE WARSAW CONVENTION AND ANY AMENDMENTS THERETO SHALL APPLY TO THE INTERNATIONAL CARRIAGE OF ANY SHIPMENT HEREUNDER INSOFAR AS THE SAME IS GOVERNED THEREBY. a. Any claim must be brought by Shipper and delivered in writing to KOKUSAI Express within 30 days of the date of delivery to destination. No claim may be made against the KOKUSAI Express outside of the time limit. b. Except as otherwise provided in KOKUSAI Express’s tariffs or conditions of carriage to which the Warsaw Convention does not apply, KOKUSAI Express’s liability shall not exceed U.S.$100.00 or the equivalent U.S $20.00 per kilogram (whichever is less)of goods lost damaged or delayed, unless a higher value is declared by the shipper and a supplementary charge paid. c. No claim tor loss or damage will be entertained until all delivery and transportation charges have been paid. The amount of any such claim may not be deducted from any transportation charges owned by KOKUSAI Express. These terms and conditions shall apply to and inure to the benefit of KOKUSAI Express and its authorized agents and affiliated companies, and their officers, directors, and employees.